We may sound like broken records here at The Brothers Brick every year when SHIPtember rolls around, but I really do believe that spaceships people build are getting more and more imaginative. Inthert‘s contribution to this year’s event is a prime example of that. 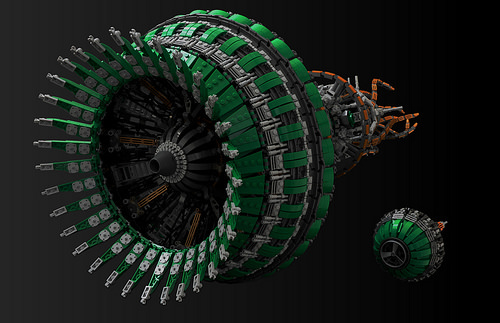 The spaceship looks almost alive, like a mix between a jellyfish, a mushroom and pure mechanical evil. Shapes are nothing LEGO bricks naturally support, but the builder has managed not only to make the dome at the front look good but also to make it open, with a beautiful mechanical interior. 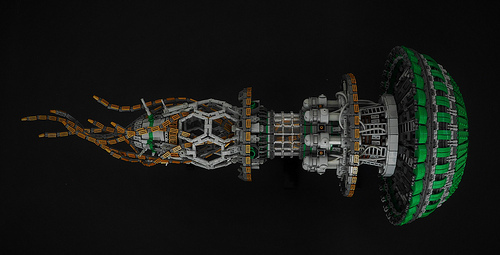 General consensus for conservative spaceship colour schemes suggests fewer colours used, carefully separated by clean lines, but somehow Inthert has managed to make his build look great even with multiple grays, black, brown, gold and green used in very intense combinations. The secret here is that each colour has a strongly defined role and makes sense in the build. As far as details go I could not even begin to cover all the ingenious little parts, but my favourite by far is the central section, where mechanical tentacles can be seen through transparent panels.